Coincidentally, after raving about how much I like Pythonista (previous review) for my iPad on the Systematic podcast, they went and released a big update with new features and a transition to a universal app. Pythonista 1.1 addresses two of my biggest complaints: lack of search and poor documentation. They also added a bunch of other awesome stuff I didn't know I wanted but really like. Without a doubt my favorite addition is the quick launch toolbar. Scripts can be added to the toolbar and run directly without having to find and load them. I pop into Pythonista and hit the toolbar entry to run the script. The documentation feels more extensive too. Even the release notes are fully linked to the documentation. But what's Python without good modules to use? Pythonista 1.1 adds new features to its "Console" module for secure entry of passwords and presenting alerts. A new "Keychain" module allows scripts to store credentials inside Pythonista rather than in the script. The "Editor" module now provides access to the Pythonista editor and the documentation includes example code for looking up selected editor text in StackOverflow. A scriptable Python editor on iOS. Let that sink in. 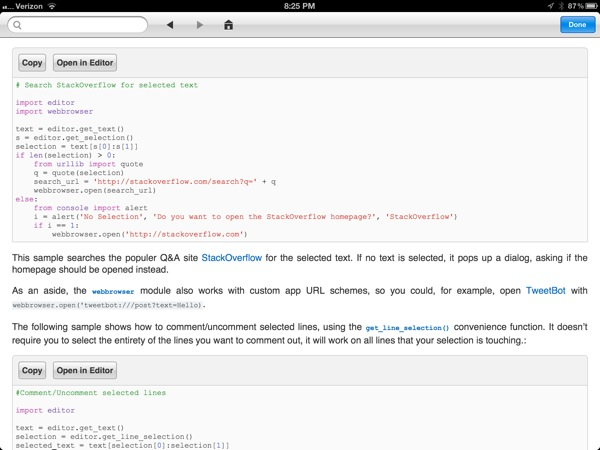 Sounds a bit like Sublime Text for iOS, doesn't it? Well, the editor includes hooks into the current selection, line and various other aspects of the editor window too. I'm watcing this development very closely. There's also a new module for opening URL's in Pythonista's built in browser. I'd love for scripting access to the browser window to enable selection of objects for use in a script but this is a nice alternative to launching an external browser. The Browser module can also open files and apps using custom URL schemes. Now we're getting somewhere close to a universal macro app. 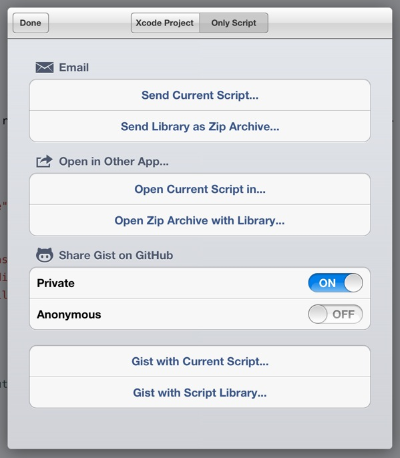 Scripts can be exported to other apps but now there is Gist sharing through Github. That's very convenient. 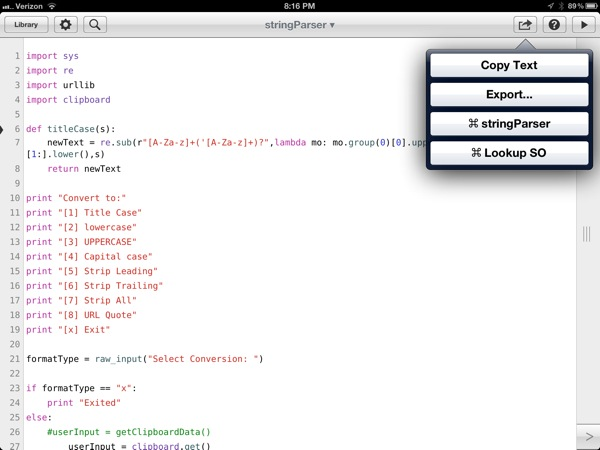 Finally, Pythonista can now export scripts as Xcode projects to build standalone apps. That's pretty mind blowing. Too bad iPad isn't a creation device.